This page was set up by Robert Sewell in January 2002 to show the Family of David Thomson and Mary Glendenning who were original settlers in Scarborough, Ontario, Canada. Robert Sewell is not a Thomson descendant. His grandmother's sister, Irene Furse, married William Richard Thomson. Their son Lionel Thomson had in his possession a Thomson Genealogy from which this web site has been copied. Click on Thomson Genealogy to go directly to this work. Robert Sewell graduated from McMaster University (Hamilton, Ontario, Canada) in 1967 with a B.Sc. degree in chemistry. After a year of studies at the University of Toronto's College of Education, he taught high school science in Collingwood, Ontario for a year and then taught chemistry, physics and general science in Hamilton, Ontario for twenty-nine years. 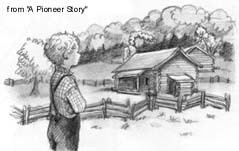 Early settlers in Ontario looked for land where chestnut, hickory and walnut trees grew. The presence of such a climax forest guaranteed excellent soil for farming. Land with a maple and beech forest was good too. Hopefully, a stream or river ran through the property. 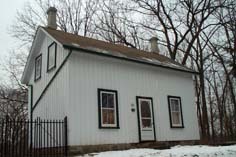 The Thomson family found such a property in Scarborough, Ontario just north of what is now Lawrence Avenue between Brimley and McCowan Roads. Highland Creek still runs through the property. Cedar and balsam trees indicated the presence of swampy ground; and pine trees could indicate sandy, rocky or less fertile soil. Such properties were, of course, to be avoided. Greenwood and Collins, A Pioneer Story. Toronto: Kids Can Press, 1994 ISBN: 1550741284 Thanks to Kids Can Press for the use of the image above. While it is written for persons age 8 to 12, this book provides a wealth of information of interest to the whole family. 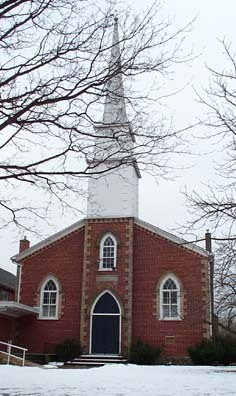 A frame church was built on an acre of land donated by David Thomson in 1831. Additional land was purchased, and the present brick church shown to the left was built in 1849. Ethel Muriel MacPherson (née Thomson) published privately in 1958 a book entitled Genealogical Chart of the Descendants of David Thomson and Mary Glendenning. Ethel undertook to record as many of the descendants of David and Mary as she could locate. It is difficult to-day for us to comprehend the scope of such a project before the days of computers, internet and email. Ethel collected her data by "snail mail" and by actually driving around and interviewing people. She compiled her data using a typewriter. She likely didn't think of herself as such, but Ethel MacPherson was a pioneer. Click on Thomson Genealogy to view the 2002 Internet Version of 1958 Ethel's book. Yes, there is a connection with Roy Thomson of Fleet Street, whose family is descended from Archibald Thomson, an older brother of David Thomson. For Lord Thomson's genealogy as well as more about the Thomson Family in Scotland, please click on Lord Thomson of Fleet. David Thomson had six siblings: William, Archibald, Andrew, John, Richard and Helen. The information that we have on these siblings (not much) can be found by clicking on Other Thomsons. David and Mary Thomson Collegiate Institute: This school may have something on the Scarborough Pioneers for whom the school is named. It appears that Mary Thomson could neither read nor write; she signed her will with an "X". David Thomson's Stone at the Genealogy.com Virtual Cemetery. Thomson Family Genealogy Forum: Post questions, get answers, help other Thomsons. The Westerkirk THOMSON Family in Canada: Bob Thomson's genealogy site. Livingston of Callendar: Robert Sewell's Scottish forebears.